Ireland’s leading security printer, DLRS is the security division of the large-scale pan regional player Smurfit Kappa and ensures customers stay ahead of emerging threats in an ever-changing landscape. Established in 1976, DLRS Limited is the market leader in security printed products, with over 40 years’ experience in the design and manufacture of secure products. 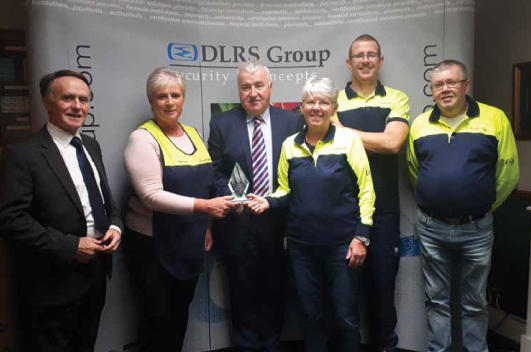 DLRS hails from a strong pedigree – it is the security division of the Smurfit Kappa Group and is Ireland’s leading security printer. The Smurfit Kappa Group is one of the leading providers of paper-based packaging solutions in the world. Operating in 22 countries in Europe, Smurfit Kappa Group is the European leader in containerboard, solid board, corrugated and solid board packaging and has a key position in several other paper packaging market segments. The Group also operates in 13 countries in Latin America where it is the only large-scale pan-regional player. A worldleader in paper based packaging solutions; Smurfit Kappa operates approximately 370 plants in 34 countries on 3 continents with over 45,000 employees. The services of DLRS incorporate consultancy, secure product design, product development, secure printing, passport production, personalisation including biometric cards (contact chip, contactless chip and magnetic stripe), numbering, bespoke finishing, full reconciliation, secure storage, secure distribution and secure destruction. The company’s reputation for quality and service is matched only by its reputation for unrivalled integrity, developed through years of working closely with government bodies. The company works hard to ensure customers stay ahead of emerging threats in an everchanging landscape. DLRS’s philosophy has always been to develop a total solution, which incorporates the needs of customers, suppliers and citizens. DLRS Limited’s core specialisation is the provision of security print solutions to the Commercial, Financial and Public sectors. DLRS Limited has an extensive portfolio of products and software solutions, which includes the Irish ePassport and passport card, the public service card, fiscal stamps for tobacco, postal money orders, cheques, motor tax discs, work permits, insurance certificates and gift vouchers. Naturally, standards are high at DLRS. “The nature of our business requires us to maintain the highest level of quality procedures and IT protocols together with stringent data protection, cyber security and disaster recovery systems,” says Tom O’Mahony. Tom O’Mahony joined DLRS in 1990 and, after several roles including Chief Accountant and Financial Controller, was appointed Managing Director in 2003. He has overseen substantial business growth and change over this time. Tom O’Mahony oversees the management of an impressive list of public sector clients and government departments, including the Department of Business, Enterprise & Innovation, the Department of Employment Affairs and Social Protection, the Department of Foreign Affairs & Trade, the Department of Justice & Equality, and the Department of Transport, Tourism and Sport. In addition the company also counts the Company Registrars Office and The Revenue Commissioners amongst its client base. DLRS Limited has delivered some the most recent cutting-edge solutions to the Irish Public Sector. “We are currently working on key projects for several government departments, to enhance their offering and services to the citizens of Ireland ” says Tom O’Mahony. Asked why a customer should choose DLRS for their secure printing solutions, Tom O’Mahony had this to say, “DLRS Limited is a proven and extremely effective provider of specialist security products and software solutions. Our team has many years’ experience delivering high profile government projects on time and within budget.” He invites anyone seeking more information to please contact SalesDLRSGroup@smurfitkappa.ie.